In this short book, Claus Offe brings into sharp focus the central political problem that lies at the heart of the EU and shackles its ability to deal with the most serious crisis of its short history. Claus Offe is Professor of Political Sociology at the Hertie School of Governance in Berlin. He is author of numerous books, including Contradictions of the Welfare State, Disorganized Capitalism, Modernity and the State, and Reflections on America: Tocqueville, Weber and Adorno in the United States. 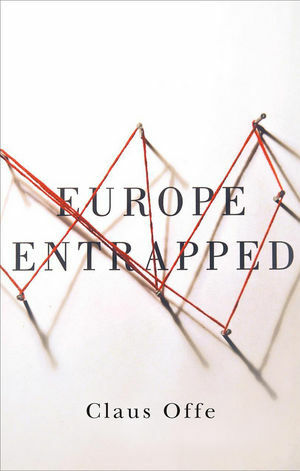 "The title of his book says it all: Europe finds itself in a trap of its own making. Offe has no easy answers as to how the continent might escape. But his 130-page essay is a model of analytical clarity and should be required reading for anyone who wants to grasp the core issues of the crisis—and eschew simple slogans and facile apportionment of blame to single nations (whether Germany or Greece)." "This is a strangely heart-warming book. While Claus Offe analyses the weaknesses and failures of European integration with ruthless precision, he also reminds us powerfully of the values of the European ideal, and shows how we could come closer to realising them - if only political leaders had the will and tenacity to do so. In the current climate of Europhobia, this is the nearest thing to realistic optimism that we are likely to get." "Claus Offe has written a passionate, probing, and deeply perturbing book that both excoriates the European Union and provides a glimpse of hope in the struggle for a social Europe." "After so many years without a resolution, it is hard to feel hopeful about the euro crisis. If there are grounds for hope they lie in this volume. In it Claus Offe describes how the citizens of Europe, and of Germany in particular, frame the crisis. He explains how that framing defines the range of feasible policy options. Offe shows how it is in the capacity of those citizens and their leaders -- of European society, in other words -- to modify that framing in ways that open the door to a more constructive policy response. Offe's careful analysis deserves a wide audience. If it receives one, Europe will be a better place." "At the core of this book is the proposition that, though the Euro was a mistake, its undoing would be a greater mistake. Around this insight, Offe describes the logic of the economic, institutional, political and cultural traps that have been sprung on European polities. The great merit of this book is that it poses the fundamental question implicit in any attempt to escape such traps: who is to be the agent of change? No one reading this book will think that this question has an easy answer; they will realise that an answer is desperately called for."